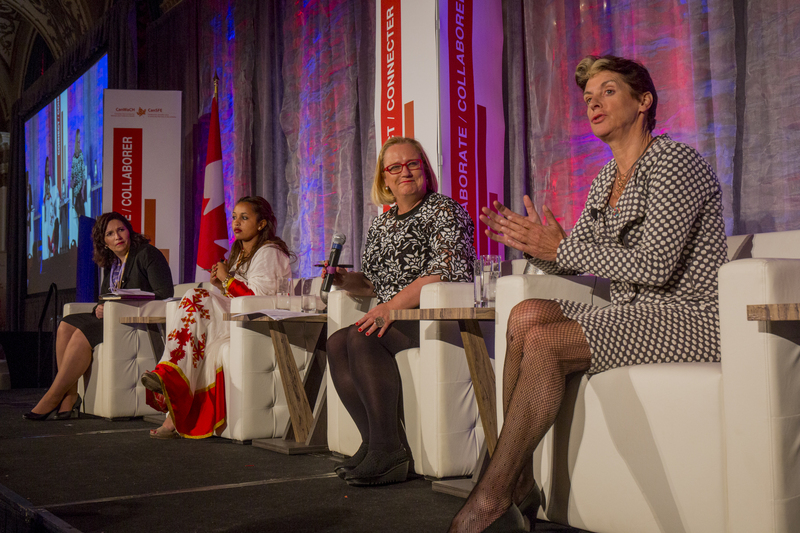 OTTAWA, CANADA – On May 17, Nutrition International hosted a high-level panel entitled “Unlocking Potential: Scaling Up Nutrition for Adolescents” at the Canadian Partnership for Women and Children’s Health (CanWaCH) Global Adolescent Health Conference: Unleashing the Power of a Generation. The plenary panel highlighted Nutrition International’s expertise and impact with speakers including Dr. Luz Maria De-Regil, Nutrition International’s Director of Global Technical Services and Chief Technical Advisor, Tsedey Teklemichael Haile, an Adolescent Nutrition Project Coordinator from Addis Ababa University, and opening remarks from Joel Spicer, President and CEO of Nutrition International. The panel also demonstrated the interdependence of nutrition and women’s empowerment through the participation of both Gerda Verburg, Assistant United Nations Secretary-General and Scaling Up Nutrition Movement Coordinator, and Katja Iversen, President/CEO of Women Deliver – who moderated the panel. With each panelist speaking to both the challenges and the solutions they see to scaling up nutrition for adolescents, the panel offered practical insights and concrete next steps to improved nutrition for adolescent girls in particular. Among the topics discussed were the challenges with the availability of gender and age disaggregated data, the difficulty of reaching out-of-school adolescent girls, the need for further political will and action in line with recent positive momentum, and innovative solutions to overcoming misconceptions and fostering community support for nutrition interventions. With over 300 attendees from around the world, and sponsorship from Every Woman Every Child, the Partnership for Maternal, Newborn and Child Health, the World Health Organization and Global Affairs Canada, this event was an exceptional opportunity for Nutrition International to help build momentum in support of adolescent girls’ nutrition and elevate nutrition as a global priority for action. A photo gallery of the conference is available on the CanWaCH website.